Small is the new luxury or that is the zeitgeist certainly in fashion – itsy bitsy handbags to replace the giant totes that contained your enormous phone, filofax and your life. Small signifies carefree, owning less, focusing on the really important things in life that make a difference. In the events world, small is the new big. Giant auditoriums, however amazing the performance, can tend to feel a little overwhelming. In fact, it’s not always relaxing to be one of a twelve hundred plus audience, navigating a theatre bar, pre-ordering your interval drinks, let alone the queues in the interval. Sometimes smaller really is better. More connection with the performers, more comfortable surroundings, and, above all else, a real sense of emotional involvement and a big experience. It’s not just that it captures attention because of the impact of the experience but there is no lessening of the quality that engages the viewer. Small in theatre terms could be an intimate and beautiful opera duet, where the performers are so close you feel they are singing for you alone or a string quartet where you can see their fingers as they hold the bows and the resin on their strings. Definitely the ultimate in an individual exhilarating theatrical experience, if you’re brave enough, has got to be ‘You Me Bum Bum Train’, the crazy, immersive and entirely sold out within minutes ride for one person that pulls into secret London locations. London has many surprising small spaces for a bijou bite-sized event and we are holding a pop up at The Jewel Tower this month, a 14th century gem near Westminster. 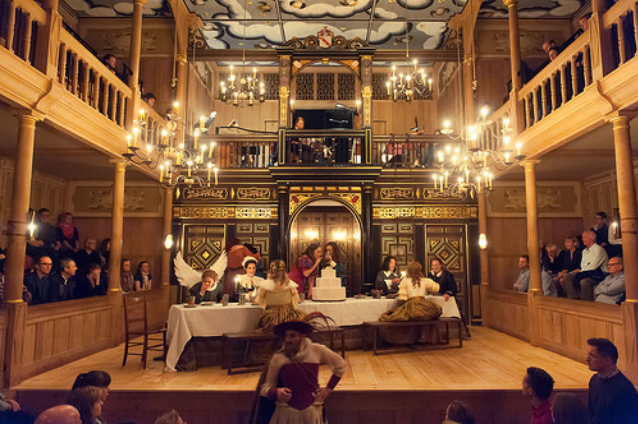 A little further down the Thames, The Royal Opera House last year staged a productions of Orpheus at the Sam Wanamaker Playhouse, a stunning candle lit theatre carved in oak. Back across the river near Liverpool Street Station, the Andaz Hotel’s Greek Masonic Temple is an extraordinary marble room that lay hidden behind a false wall for years, wonderfully ornate if slightly spooky. Of course, back at the centre of fashionable Soho if you want to be shocked then hasten to The Box – a beautiful old theatre restored as a nightclub, with on-stage ‘varieties’ and theatre-style tables where you can sip on extortionately priced cocktails whilst you are immersed in some of the most extraordinary burlesque acts from around the world. So when planning your next dinner or party celebrate the small things and do them in a great way and your event will shine and the experience will be hugely memorable.